The Battle of Sullivan’s Island took place June 28, 1776. The Battle of Sullivan’s Island was located near Charleston, South Carolina. Sullivan’s Island was a large island at the entrance to Charleston harbor. British frigates had scouted the area in May and observed the construction of the American fort on Sullivan’s Island. The Battle ended in victory for the American colonists. The Battle started when the British army and fleet attacked Charleston. The entrance to Charleston Harbor was protected by sandbanks. The channels through these sandbanks lead directly to the end of the Island where the Americans had built a fort of 16 feet wide palmetto logs filled with sand. General William Moultrie was commander of the fort and it was named in his honor, Fort Moultrie. The British fleet sailed into the harbor to attack. The fleet consisted of 9 man-of-war ships carrying 300 large cannons. The cannons were fired but the balls were stopped by the soft sand-filled palmetto logs. During the conflict a flag commissioned by the colonial government and designed by Moultrie was shot down outside the fort. Sergeant Jasper, a patriot, risking his life, grabbed the flagstaff and set it up on one of the ramparts. General Henry Clinton and Admiral Sir Peter Parker commanders of the British troops attempted to cross to the further end of Sullivan’s Island under fire from Americans on the beach. Unexpectedly the water deepened, and the British had to jump aboard their ships to save themselves from drowning. Clinton ordered a retreat and the fleet sailed away from Charleston. THE LIBERTY or MOULTRIE FLAG. 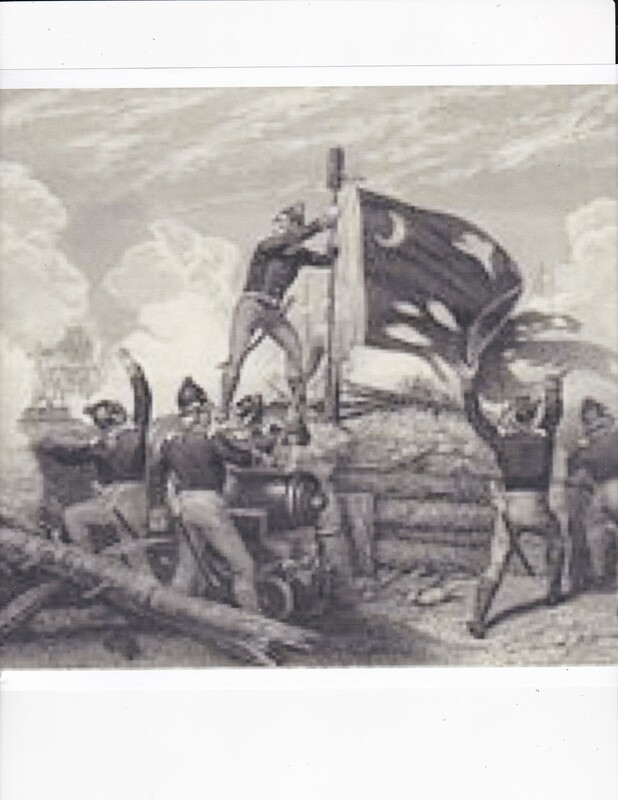 The picture of the battle shows the flag that was designed by Colonel William Moultrie. The flag was commissioned by the colonial government and the design was a blue flag with a white crescent saying LIBERTY on it. The flag became known as the Moultrie flag or the Liberty Flag. Later on during the Revolutionary War in the 1780 siege Charleston was taken by the British and the flag was taken. The ‘Liberty Flag’ was later reclaimed by American forces at the end of the war, the flag was returned to the city of Charleston by General Nathanael Greene. The significance of the conflict was that the small force of mostly militia (435 men) were able to force the retreat of 9 British ships (2200 men) with the American casualties being 12 dead and 25 wounded while the British lost 63 killed and over 150 injured. This was good news and was used as propaganda in newspapers to encourage the Americans to fight on. In 1777 Americans celebrated “Carolina Day” commemorating the first major victory of the British. Parades in downtown Charleston and reenactments at Fort Moultrie are still an annual event. Morrill, Dan (1993). Southern Campaigns of the American Revolution. Baltimore, MD: Nautical & Aviation Publishing. Russell, David Lee (2002). Victory on Sullivan’s Island: the British Cape Fear/Charles Town Expedition of 1776. Haverford, PA: Infinity. Stokely, Jim (1985). Fort Moultrie, Constant Defender. Washington, DC: National Park Service. Wilson, David K (2005). The Southern Strategy: Britain’s Conquest of South Carolina and Georgia, 1775–1780. Columbia, SC: University of South Carolina Press.